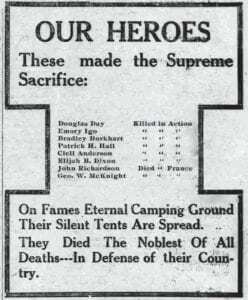 War dead honored 100 years ago The November 21, 1918 edition of The Mountain Eagle carried this illustration in which homage was paid to eight Letcher County men who were known then to have lost their lives fighting overseas in World War I. The list of Letcher County soldiers who gave all — through battle, disease or wounds that never healed — eventually grew to 21. This Saturday marks the 100th anniversary of “The Armistice of 11 November 1918,” the agreement that brought an end to the Great War. The date became known as “Armistice Day” and in 1938 was designated as a legal holiday to honor World War I veterans. In 1954, Congress passed legislation changing the word “Armistice” to “Veterans,” a move that resulted in every November 11 being designated Veterans Day in honor of the service of all military veterans in the United States. “Keep this Eagle,” urged the headline buried — most likely because it was the only place where room was still available — at the bottom of the front page of the November 21, 1918 edition of The Mountain Eagle. Although the coming of two major railroads six years before had already opened much of Letcher County to the outside world, news of national and international importance was still slow in reaching the end of the line. Such was the case with the news that the Great War — now known as World War I — had ended. The recommendation for hanging onto that 1918 edition of the newspaper — which was printed 100 years ago in downtown Whitesburg — came 10 days after military leaders representing the allied nations of France, Great Britain, Japan, Italy and the United States gathered with German officials in Compiégne, France to sign “The Armistice of 11 November 1918,” officially marking the Allies’ defeat over Germany in a war that resulted in the deaths of 40 million soldiers and civilians. The war started in 1914 after the assassination of Archduke Franz Ferdinand of Austria. The United States joined the fighting some 2-1/2 years later — declaring war on Germany first and then Austria-Hungary. The fighting was responsible for the deaths of 117,466 U.S. soldiers, at least 21 of them from Letcher County. When The Mountain Eagle went to press with that November 21, 1918 edition, the names of eight soldiers from Letcher County were listed as having been killed in the war, but Editor Nehemiah M. Webb, who founded the paper in 1907, let it be known there would be more names to follow. 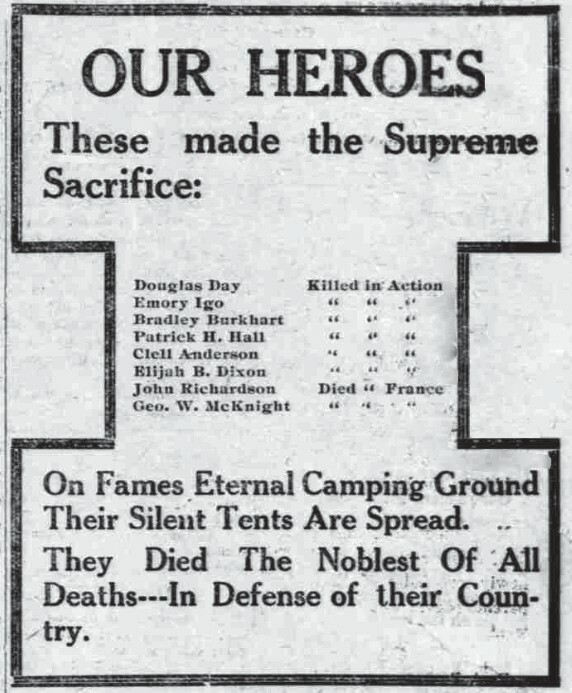 Among the eight soldiers included in The Eagle’s initial listing of the war dead were McClellan Anderson, Bradley Burkhart, and Douglas Day, each of whom was killed in action. Today, Letcher County’s three active American Legion posts are named in their honor — Anderson at Neon, Burkhart at Jenkins, and Day at Whitesburg. The good news The Eagle carried about the signing of “The Armistice of 11 November 1918” was accompanied by other war-related news, some of it hopeful, but much of it bad. From the bad category came this report, headlined “Killed In Action”: “The above words coming from the War Department convey a sad truth to the many loyal friends of young Patrick H. Hall, one of Whitesburg’s best and most popular young men. News of his death at the battlefront reached here Monday night. The telegram stated that young Pat was killed on October 12, exactly one month before the armistice was signed and the fighting ceased. “Soon after war was declared, Patrick Hall, flushed with ambition and strong in intellect and manhood, immediately volunteered for service and was for several months stationed up East. About six months ago he went with his regiment to France and was among the first to reach the firing line. The November 21, 1918 edition included even more bad news. “Reports from the War Department reached here that Elijah B. Dixon, of Indian Bottom, was killed in action in France on October 18,” Editor Webb wrote. Still, there was some more good news to report as it related to the war and its ending. The following names of men who died in or as a result of World War I are listed on the war memorial in front of the Letcher County Courthouse in Whitesburg : John Adams, Ralph Adams, Clell Anderson, David Brown, George Brown, Sylvan Brown, Bradley Burkhart. Also, Curtis Cornett, Douglas Day, Elijah B. Dixon, William Dixon, Charlie J. Ford, Patrick H. Hall, Joe Handy, Henderson M. Hubbard, Emery Igo, Tom Johnson, Henry Maggard, George W. McKnight, Frank W. Scruggs, and Joseph Sexton.